"'In an economy like we have today, I don't see people shelling out hundreds of dollars for a device which replicates something they already have,' says Bill Mirabito, head of e-commerce researcher B2C Partners." But while the Kindle 2 certainly is no bargain at $359, I doubt that Kindle for iPhone will cut into Kindle hardware sales one bit. If anything, the app may actually spur Kindle sales by introducing millions of iPhone/iPod Touch users to the world of e-books. Let's face it: Reading e-books on the iPhone's 3.5-inch display isn't a lot of fun. In fact, it's ergonomic hell. The screen is simply too small. A few hours of finger-dragging and screen-tapping to navigate pages and resize text is enough to drive anyone crazy. The experience is akin to placing a novel under a magnifying glass and reading a few words at a time. Sure, a few iPhone diehards will dig this, but most users will try it and give up. By comparison, reading an e-book with a Kindle is a pleasant experience. With its paperback-size proportions, Amazon's reader displays a full page at a time. 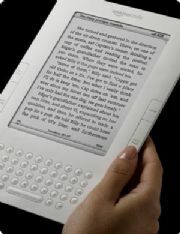 Its large, ergonomic buttons make it easy to turn the book's virtual pages, and you can tap the screen to access certain controls. And its non-backlit e-ink display is far easier on the eyes than the iPhone's backlit screen, particularly if you plan to read for an hour or two. Furthermore, Kindle for iPhone is intentionally crippled. You can't, for instance, access Kindle's blogs, magazines or newspapers. But since iPhone users can get most of that content via the Web anyway, that's probably not a major shortcoming. Overall, however, Kindle for iPhone is almost certainly a promotional play by Amazon--an attempt to sell more hardware and e-books. Only users who are fond of repetitive stress injuries and eyestrain would read full-length books on an iPhone. However, if Apple ever launches a large-screen iPod Touch, then maybe Amazon will have something to worry about.